Those Canadians. It must be something in the water–or possibly in their government-funded arts programs–but four of my very favorite gay authors (Peter Dube, ‘Nathan Burgoine, Shawn Syms, and Christopher DiRaddo) are residents of that country. Burgoine’s Light was a keenly done superhero love story as sharp as it was sharp-witted, Dube (author of the prose poem collection Conjure) and Syms have new collections either out or just released (and will be featured here soon), and DiRaddo’s first novel, The Geography of Pluto, has also found its way into my hands. And it’s a pleasure to report his debut ranks right up there with the best work of his aforementioned countrymen. Montreal high school geography teacher Will Ambrose can’t seem to get beyond his breakup with his ex-boyfriend Max. Despite the best efforts of his best friend Angie, he dwells far too much on the past even though the present requires his attention. After one battle with cancer, his mother finds herself dealing with another round of the disease with only Will to help her through. But Will’s preoccupation with getting Max back threatens both their holds on stability. Make no mistake, this is not a novel with intricate plot twists and turns. It is character driven, but that doesn’t mean it’s directionless. Will has a purpose in mind, even if it’s just getting himself through the day or–even worse–the night. We’ve all been there. He’s mystified by Max’s departure. When Will calls Max out of desperation, we are as astounded as Will when Max agrees to see him. Even more astounding is that they attempt a reconciliation, but we know it won’t work. So does Will. But Will’s biggest fear, the one he never states but pervades the book, is that he will end up like his mother–alone, dependent solely on work to structure his life, and facing cancer. The parallels between mother and son are too ably portrayed to miss, but the biggest is that they are both unable to move past their lost loves (Will’s father died when he was quite young). It’s no coincidence his second try with Max happens once his mother’s been diagnosed. They are both afflicted, paralyzed by their visions of what their lives should be, yet unable to make those visions reality. They both come to learn, however, that permanence is a myth and that life is only a series of temporary realities. Over the last three months I had been troubled by another imprint that lingered on my walls and furniture. Although he had never lived here, Max’s indelible presence could still be felt in the apartment, his scent burnt into the wood like waves upon waves of incense. It spooked me, sometimes, being alone in this space. It reminded me too much of who I used to be, who I was when we were together. Sometimes it felt as if I were the thing that didn’t belong in the room. This was someone else’s house, a happier person who was long disappeared, and I was living in his place as a squatter. 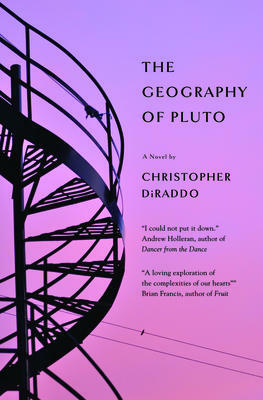 Di Raddo’s first novel is a terrific debut that will have you mulling over the characters long after you’ve finished. They resonate that strongly. Highly recommended.